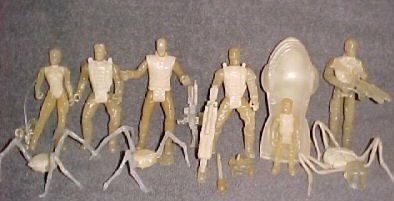 An amazing unpainted Trendmasters Lost in Space Movie prototype set of 6 action figures. This is an unmarked, unpainted test shot set that was used to test the steel molds before the final product was mass-produced.This is the true meaning of rare when it comes to collecting. These ARE NOT the over produced "prototypes" that are flooding the Internet from China & Hong Kong.